Mumbai, the economic capital of India, offers dream avenues for making money to the people. And, as the city scores over any other city in almost all spheres of money-making, how can it be behind in betting? Betting started in the form of ‘Matka’ in Mumbai and spread throughout the country very rapidly. 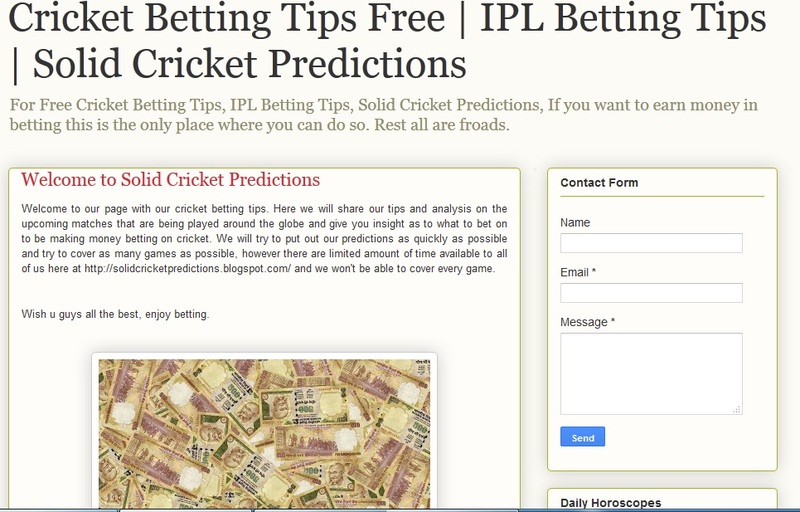 When cricket betting started in India, the Mumbai punters (betters) soon developed it as a hobby. As of today, Mumbai is contributes around 60 percent of the total betting revenue on cricket, and the hysteria attached with cricket betting is much higher than the craze of the game itself. Today, the gamblers and bookies of Mumbai are operating a parallel economy within the society. The extent and magnitude of their operations can be gauged from the fact that they handled a turnover of around Rs.45,000 crores in about one month during the World Cup 2003. People from at least 6 countries of the Indian subcontinent are playing Satta through Mumbai bookies. Even residents of Gulf nations wager their money in this illegal trade using Hawala channels. Cricket betting is being controlled by Mumbai mafia since 1986. Betting on cricket and match fixing are part of underworld don Dawood Ibrahim’s various activities for last two decades. Among the criminals, Matka king Ratan Khatri was the first to approach the film industry for investment, and was followed by don Haji Mirza Mastan and others. However, now the lion’s share of crickets betting is owned by Dawood, and attempts to deprive him of it have not succeeded. In India, cricket betting appears to have originated somewhere in 1975-76. No one knows for sure how and when this trend actually started. In those days, the main bookie was Shanti Kamathi. He is not active in the field now, but was the pioneer in cricket betting in the country. He is now living peaceful life in a Walkeshwar apartment, from where he had run his black business for more then a decade. His successor was Subodh Mehta, father of today’s biggest bookmaker of the country – Shobhan Mehta alias Shobhan Kalachouki. Subodh has retired long back and lives with his son in Kalachouki. There are many old people who say that the 1977 Indo-Pak match in Kolkata was fixed. They say that this was the first case of match fixing in the history of cricket. AT that time, Sunil Gavaskar was Indian captain and Aasif Iqbal was captain of Pakistan team. The toss rate for India went down to 20 paisa, which was not possible at all. The rate for the win of toss for Pakistan was Rs.4. Those days only the captains used to go to the ground for the toss. When bookies came to know about toss fixing, the first Valan fok (betting cancel) was announced. Before this incident, a Souda fok was unheard of. The response of cricket lovers was overwhelming when the Reliance Cup was organised in India in 1987. Till this time, television sets had reached the homes of common Indians. The big time bookies during those days were Shanti Kamathi, Subodh Mehta, Malchand Bagdi (Walkeshwar), Pradip Shakti (Ghatkopar), Vinod Chembur, Dungar Singh Kot (Fort), Dhiraj Sunrise (Ghatkopar), Jeetu Ghatkopar, Jolly Santacruze, Dinesh Santacruze, Virendra Borivali, Puran Chawla (Khar) and others. It is also said that the Reliance Cup match between West Indies and Sri Lanka in Rajkot was fixed by Shanti Kamathi. A source from the betting market says that win rate for Windies was 14 paisa opposite to Rs.6.50 for Sri Lanka. Windies returned back to the pavilion scoring 150 runs, and Sri Lanka won this match by 8 wickets. It was widely rumoured that Sri Lanka had won because of Shanti Bhai had fixed the match. After this, the common man also started participating in the cricket betting. Sitting in his cosy apartment and remembering the old days, one of the senior bookies says, ‘We did not have the facility of live telecast of the matches in our days. We had to purchase a big size National’s World band radio for our business purpose.’ This radio was available in the shops of Crawford Market in South Mumbai, where it was smuggled in and sold for Rs.7,000. A very limited numbers of smugglers were capable to smuggle these radio sets from Japan, Gulf countries or eastern Asia, and used to increase its price at the time of cricket matches. Those days, the bigger bookies used to send one of their men to watch the match in the stadium. That time MTNL had only ‘Switch gear system exchange’, in which tracing a line was very difficult. The linemen of the MTNL were providing one illegal telephone line with 24 hour STD/ISD facility for 5 to 10 thousand rupees to a bookie. A bookie from Boriwali recalls, ‘Our man was sitting in the stadium and having a telephone line there too. We were updated ball to ball by him. On this we were opening the rates and taking the bets.’ He also informed that a big time bookie, Jeetu Ghatkoper was running a ‘Line’ and small time bookies were taking ‘line’ from Jeetu Bhai. Jeetu Bhai was opening the rates and others use to follow him listening through this line. Linemen were providing extra lines for Rs.400 per day per line. After the Gulf War between Iraq and USA, in 1992, cricket betting went on the peak point. Puran Chawla, who runs a big BC from western suburb, was having a full size disc antenna at his office roof top. He was the only person in the entire country who could watch worldwide channels through this antenna. All the bookies used to take ‘weather report’ and match reports from him. He was running ‘lines’ for all bookies and even used to fix the rates. According to a source, during the same period, the ICC had removed the ban on South African team. They came to India to play three one-day matches. India won first two but the third match was won by South Africa. This match was also fixed and no one thought that South Africa will win the third one. Jeetu Ghatkopar lost 12 Crore rupees in this series and was unable to repay, so he consumed poison and committed suicide. By this time, around 100 new bookies like Ashok Royal, Vinaod Boriwali, Kirit Lalan, Kothari Borivali and others emerged in the market and started book-making up to Rs.10 to 20 lakhs via telephone. By the end of 1998, Vinod Chembur, Pradeep Shakti, Dhiraj Sunrise and Dungar Sing Khot went away from the market and from 1999 new names like Shobhan, Virendra Borivali, Kothari Borivali, Hitesh Smrat, Ramswarup, KK came in to the light. A source from the Satta Bazaar assumes that in Mumbai itself there are approximately 1,000 small bookies working in the field. It is known that betting king Shanti Kamathi, who used to play with lakhs of rupees daily in the market, is now in such a heavy financial crises, that he has no money even for his daily requirements. For this reason the popular saying, ‘Jugar main, subaha upar to sham ko niche’ suits the market. ‘Weekly settling’ (weekly transactions) was the trend in the market 7-8 years back, but now market is working on a daily transaction basis. The transaction takes place as soon as the one-day match ends and for the test matches, settlements are done after the end of the test. Nowadays many matches are being held throughout the year, so the bookies adopted the daily system to make the record keeping system by the punters easy and simple. It must have been a bad day for them when Vinod Chembur, Ashok Royal, Shobhan Mehta heard that Dawood Ibrahim has also entered cricket betting. The D-company was facing problems in other illicit trades like narcotics and arms smuggling, extortion from film, hotel and building trades, and came to know that gamblers from all over the world are pouring their money in cricket betting. The mafia don saw big money in this business too, as he realised thousands of crores were being transacted in few days in this business. Dawood bet on Rs.3 crore for Pakistan in Sharjah Coca Cola Cup and lost it when Pakistan lost. When Pak team lost two matches, Dawood announced ‘Souda Fok’ and told all the bookies, ‘sare paise vapas, na lene ka, na dene ka.’ He ordered all the bookies that they should stop the betting. Bookies were terrified due to this threat. The Meter of the market missed the pulse. Vinod cancelled the betting to save his life, but Shobhan disobeyed Dawood’s orders. Dawood sent a striking team to kill Shobhan, but its members were arrested by the Crime Branch officers before they could strike their target. A bookie from Borivali informs that he has started his business though Internet. Internet is safe, fast and reliable, and it is almost impossible for the police to stop them from using this medium. Bookies change their e-mail address as frequently as they change their telephone numbers, but the punters come to know that on which e-mail ID they have to lay bets. This bookie explains, ‘Cable internet made my life easy. I am paying only 700 rupees in a month, which is much less than what my telephone expenses used to be.’ He also says that the impact of using the net created some problems for him as punters don’t have net connections of their own. They have to go to some Cyber Café to place a bet, and might have to spend at Rs.10 to 15. Dawood is in charge of cricket betting from 80s, and had started match fixing and betting in an organized manner. His presence in the Rothmans cup in Sharjah in 1996 was the beginning. In this match, an Indian photographer shot some photographs of Dawood sporting yellow T-shirt, white trousers and black sun glasses. That day he was sitting in a VIP box with some of his lieutenants, betting from the stand using a cell phone. He was a regular fixture at Sharjah matches for four years, but stopped going after his name was associated with cricket betting. Then Dawood made a team of punters, fixers, bookies, financers, traders, hawala operators and started organized betting-fixing. The in-charge of this operation was Sharad Shetty in Dubai. Dawood’s lieutenants were getting protection money from matka and gambling den operators. Those who denied were raided by ‘Dawood’s moles’ in the police. Those who dared after this too were attacked by squad of ‘supari killers’. This strategy worked and some bookies contacted mafia don on their own for protection and recovery of betting money. A trader of Raheja Complex of Malad (E) lost his last penny on Indo-Pak match in 1998. He was betting on an Indian win and bet with Rs.17.5 lakhs. India lost the match by one run on last ball. As he couldn’t repay, the D-Company men went to his place and took charge of his brand new car, flat, cash and ornaments as recovery. Dawood was using bankrupt traders for betting and youngsters who were greedy and skilled in PR were used for fixing. 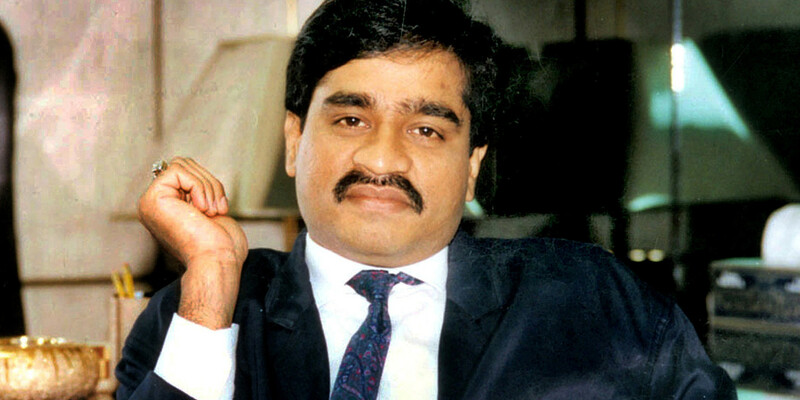 Earlier, bets were accepted in only in Mumbai, Kolkata, Chennai and Bangalore, but Dawood extended this network to Dubai, Sharjah, London and South Africa. After the serial bomb blasts in Mumbai in March 1993, Dawood and his lieutenants left Dubai and took shelter in Karachi. He started cricket betting from Karachi and Islamabad. He had complete support of his brothers Noora and Anees, lieutenants Ejaj Pathan, Chota Shakeel and Abu Salem. A squad of 30 people like Sanjay Chawla were fixing and betting in matches on his behalf. Mumbai bomb blast jolted not only a city but Dawood gang as well too. Angry Hindu gangsters went against him, and Subhash Sing Thakur left the gang first. Chhota Rajan went to Malaysia and started his operations alone, and soon started creating problems in D-Company’s smooth operations. Rajan even went to the extent of providing information to the Delhi police regarding match fixing. For the same reasons, Rajan killed Sharad Shetty on January 9, 2003 in Dubai with the help of Muthappa Rai and Pak betting mafia dons Bada Umar-Chota Umar and Haji Mohammad. Dawood is earning millions of dollars every year from cricket betting and match fixing. His man in Karachi, Farukh Kazi, is one of the major bookies of Pakistan and is using Indian network for his operations. This network was working separately and had no connection with Shetty’s operations. When Pak team lost against Sri Lanka by 115 runs, Farukh went under heavy losses, as he lost Rs. 29 crores. In Mumbai too, Shobhan lost 40 lakhs, Ashok Royal lost 1 crore, Dinesh-Girish 75 lakhs, Ramji Thane 1.4 crores in the said match. At least 5 small bookies lost every thing they had. This happened due to failure to fix the Sri Lankan Team. However, Mumbai was still the number one hub for betting, with Arab Gulli on top in the business. At that time, Dinesh-Girish duo was the biggest Pak connection in Mumbai and worked in connivance with a Pakistani Bookie. They did recovery business too and paid the bookies money after deducting their commission from the recovery from punters. Then they recovered the money in ‘their own style’ from gamblers. Dinesh-Girish duo managed the local police so well, that if crime branch, CID or any investigative agency officers tried to go in to their gulli, they were informed well in advance. They could stop their operations, collect all material, shut down the shop and disappear from there within few minuets. In 1999, Girish went deep into trouble and tried to come out but failed. Then he left the field and disappeared from Mumbai. The duo’s godfather, Chote Miyan, a local gangster from Arab Gulli, was not only opening the rates, resolving the problems but keeping the track on the profit margin of bookies too. His crony Shayam Bhai was working from Goregaon and keeping an eye on the trade of Western Suburbs. He was the biggest Hawala operator for the bookies. Ramesh Kapadiya was taking betting on 10 cell phones from Aanand Bhuvan of Mathura Das Road of Kandivali. It is also learnt that many bookies gathered at his den before a match started and secured the rates. Jagdish Pin was living in Raheja Complex, Malad (E). His connection to hairpin business provided him nick name ‘Pin’. Bipin and Raju also bore heavy losses in a match. Jitu also lost 45 lakhs in one match. Ashok Soni suffered a loss of Rs.2 crores and was not able to pay the punters. Some of them attacked him and injured him badly. He was immediately rushed for treatment to a near by hospital, but withdrew himself from the betting field thereafter. By May 2000, Mumbai police was well aware of cricket match fixing. It had come across strong evidence while investigating the Mumbai bomb blasts. Then DCP of Crime Branch, Rakesh Maria, had found a photograph in which a former Indian cricket captain and Dawood were dinning together in Dubai. He registered this in the daily records of the investigation. 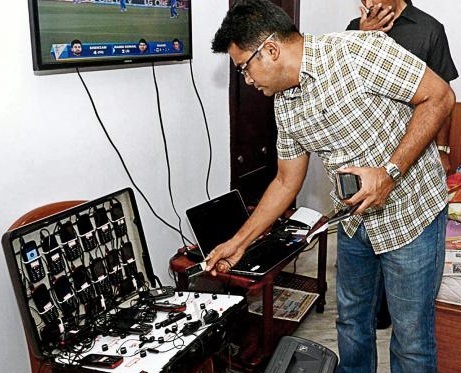 Tehelka.com reporters recorded Maria’s statement with a hidden camera, in which he told them about match fixing and cricket betting, Dawood’s connection with the business, and active participation of Shakeel and Shetty. In his statement, Maria clearly stated that the former Indian captain has a criminal bent of mind. ‘We have traced calls to Dawood, Anees and Shetty from his mobile phone record. He used to change his mobile numbers frequently,’ said Maria. A powerful politician, who was also connected with the Board of Control of Cricket in India (BCCI), ordered senior police officer not to act on Maria’s report, and focus the investigation on the bomb blast case only. He was alleged to have instructed the police to take no on the audio tapes that established cricketer-bookies nexus. Many film personalities are also involved in the cricket betting. Many of them were regulars at Dubai and Sharjah to watch the matches. They had enough information regarding mafia-cricket-bookies nexus, and some of them even provided finance to the fixers. When Income Tax (IT) officers raided Shobhan’s residence in Parel, they found piles of discriminating documents and bundles of unaccounted money. In one of his personal diaries, IT officers came across cell and satellite numbers of famous cricketers and infamous mafia dons. ‘This raid helped us in the investigation of match fixing scandal. Documents proved nexus of cricketers and criminals. We got details of cars, flats, and unaccounted property listed in Shobhan’s papers,’ said a CBI officer. Economics of a match is very simple. If bookie receives Rs.200 crores for a match, Rs.1 to 2 crores will go to mafia for protection, the fixers will get around Rs.25 to 50 lakhs; and the investors will receive Rs.1 to 1.5 crores if they put in Rs.25 to 35 lakhs for fixing. These white collar criminals are mostly friends or relatives of a fixer. ‘Investors are getting up to 25 percent interest on their investments. They provide money to fixers by Hawala one week before the match, and receive their returns after it through the same channel,’ said a senior police officer. He also said that some time friends or relatives like flop star Kishan Kumar make money available without having knowledge of fixing. They get engaged in the activity on the basis of a relationship but find themselves in the police net after some time. The cricketers also make a neat amount in the business. 4 to 5 main players of a team are actual beneficiaries. Batsmen get Rs.20 to 25 lakhs for throwing the match; the team Capitan gets Rs.25 to 40 lakhs. The bookies bear the highest risk in this business. They have to be very cautious that betting should not fail. They write punters’ names and bet amounts in their ‘Chopadi’ (books) or enter them in laptops in codes. Bookies get good profits in a normal match if it is not fixed. Normally their rate of margin is 10 to 15 paisa. Smaller bookies take bets as per their capacity and then cut their bet with a bigger bookie. In cricket seasons, Hawala operators increase their rate of premium too. They generally charge Rs.1.25 to 1.50 per Dollar in regular course, but increase it by 25 to 75 paisa in the cricket season. In the betting world, bookies says that ‘Police is third umpire’ in their game. The police gets a hafta of Rs.1.5 lakhs every month for not raiding a bookie. This amount can increase at the time of World Cup matches. Sources inform that payment problems are generally handled by a bookie’s staff, and they depend on the underworld in very critical situations only. The bookies offer handsome amount ranging between Rs. 5,000 to 25,000 per month to their staff. Some bookies hire staff on partnership basis, which is 5 to 10 percent of total profits. ‘We keep our staff happy and pay them well. If they are not satisfied, they can become informers of police or underworld. Staff khush nahin toh dhandha bhi nahin chal sakata,’ said a bookie. ‘If you take help of Bhai log (underworld) for ‘ugraani’ (payments), you are putting yourself in great trouble. Unka meter chalu ho jata, bad main kam krao ki nahin,’ he adds. He says that the bookies only resort to taking help from the underworld when they face problems from the punter. This happened with a son of a Chief Minister of Hariyana state. In second week of September 2002, a son of former Chief Minister lost Rs.5 crores in betting. He refused to pay the money to Hitesh, who informed this to D-company that one Ajay (name changed) from Delhi is not paying the money. A D-company phoned Ajay and threatened that he would be killed. Ajay went to Delhi crime branch and lodged complaint against Hitesh and D-company. Delhi police acted fast and came to Mumbai to arrest Hitesh Samrat. However, Ajay was tipped off by his bosses from Dubai and went underground before the police team could reach him. In April 2002, it became quite clear that betting and Mumbai mafia were two sides of the same coin. Chhota Rajan launched an attack on the betting industry to decapitate Dawood’s financial backbone. Rajan knew that Mumbai police would not work on his tip off; he passed information to the Delhi police, as there were no Dawood moles in the force. First Patel, then Shah & Shetty… Now? Mafia started activities to eliminate the links of cricket-mafia-fixing in May 2000. Ashraf Patel was killed in Mumbai, and then Uday Shah died in a hospital in South Africa. This strongly indicated that there was no control of police and CBI on this issue, and they will never reach the depths of this scandal. Shah was a short and fair complexioned young entrepreneur, who used to sport a gold bracelet in left hand, and was believed to be involved in fixing scandal. His business was taking contracts of advertisement hoardings of stadiums, in which he used to make millions. Shah had relations with some of the big cricketers, who used to visit South Africa on his invitation and enjoy his hospitality. Shah died due to bite of a poisonous bug. He was admitted in the hospital for 3 days and suddenly expired with all information of match fixing. However, the CBI officers believe Shah’s death was not normal. They suspect that as Mumbai mafia killed Patel to protect the identity of corrupt players, they also managed the killing of Shah in South Africa. However, it is strange that when the CBI knew that Shah knew too much about fixing, then why did it leave him alone to be killed? The way investigative agencies were investigating the match fixing case, it is clear that none of the culprits will ever be punished. And the case of national shame would be buried in the dust of time. Patel was a proud owner of over a dozen shops in the famous Heera-Punna market of Haji Ali area, more then a dozen plush flats, and agencies of most prestigious brands of perfumes & watches of the world. His father was close to infamous smuggler Haji Mastan and was him self a smuggler. Patel had good relations with all leading film and cricket stars. It is said that he had gifted a Swatch worth Rs.12 lakhs to Yukta Mukhi too. When Patel was killed in broad daylight, the police took the incident very lightly. No cricket or film personality was called for questioning; investigating officers told media that this was not necessary. However, Patel left behind a number of unanswered questions. Were his shops a Hawala front? Was Patel a Hawala operator for rich and famous for their illegal earnings abroad? Was he sending the illegal money of cricketers to other countries? Was he connected to the fixing racket directly? Needless to say, Patel’s death was a big jolt on the fixing scandal investigation. Then the question arose – who will be next target? Shobhan, Dinesh Santacruz or Abdulla? Shobhan had good relations with three generation of cricketers. It is also learnt that he gifted precious gifts to the cricketers. Police are in possession of a video of a marriage party of a famous cricketer, in which 12 bookies were invited. They attended the party and Shobhan had gifted the bride an expensive gold chain. The police felt no need to ask this cricketer why Shobhan was in the party, on what basis he was invited and why he had gifted golden ornament to the bride? Police believe that those acting as links in the fixing scandal were soft targets for the mafia. If they were all killed, no one would be able to fix the fixers. It emerged that the Pakistani betting mafiasos Bada Umar-Chota Umar and Haji Mohammad killed Sharad Shetty, Dawood’s lieutenant, with the help of Chhota Rajan and Muthappa Rai. Umar brothers were annoyed with Shetty because he had grabbed the entire cricket betting business with the help of Dawood, ISI and Pak Military Intelligence (PMI). Rajan was also after him to take revenge of attack in Bangkok. Muthappa was also waiting to take vengeance for the tip off to the Dubai authorities for his illegal immigration documents and passports. Umar brothers and Haji provided all necessary information and logistics to the attackers, Muthappa provided boys to shoot and Rajan spent more then Rs.5 crores and smuggled weaponry to Dubai by sea route. They killed Shetty a few days before the Cricket Word Cup’03 started on February 8. In this case, Tariq Parveen, D-company’s second in command for cricket betting, was also arrested by Dubai Police. Thereafter, no single individual could claim to be holding the reins of cricket betting in his hands. Dawood’s control slackened and the bookies were quite happy with the situation. Bookies breathed easy after ‘Bada Idly’ was eliminated. Those who had to pay Shetty were joyous because they did not have to pay him. However, some were in a worrisome state as they had been promised to be paid back by last week of January ’03. A bookie pays bribe or protection money to local police and Crime Branch officers every month to ensure operation of his business. No bookie can operate without paying Section. A senior bookie from suburbs says, ‘Hamara kaam hai kamana, unkaa kam hai hamein lootna. Who log tak agar section time pe nahin pahuncha toh kayamat hi aa jaati hai.’ (Our job is to earn the money; their (police’s) job is to loot us. If we will not send the section amount regularly in time, they create lots of problems for us.) When asked, he charted out the money list quickly which goes to the Khakhiwallas. Section depends on the size of business of a bookie and area of operations. The world of bookies is as big as the underworld. There are special bookies for Cricket Betting in India and abroad, and there are three layers of bookies in the market. The top bookies conduct a business of more than Rs.1 crore every month, mid-size bookies between Rs.50 lakhs to Rs.1 crore, and smaller bookies less then Rs.50 lakhs. These bookies work under some fictitious business, which could be a video library, dairy, hotel, import-export business, or they may even wear the garb of a social worker. The list of Mumbai bookies is vast. Mumbai (Old) – Shanti Kamathi, Subodh Mehta, Malchand Bagdi (Walkeshwar), Pradeep Shakti (Ghatkopar), Vinod Chembur, Dungar Singh Kot (Fort), Dhiraj Sunrise (Ghatkopar), Jeetu Ghatkopar, Jolly Santacruze, Dinesh Santacruze, Virendra Borivali, Puran Chawala (Khar). Mumbai (New) – Shobhan Mehta @ Shobhan Kalachouki, Jayanti Malad, Ashok Royal (Marve Road, Malad-W), Vinod Borivali, Kirit lalan (Borivali), Kothari Borivali, Virendra Shah @ Virendra Borivali, Hitesh Samrat @ Hitesh langda @ Samrat (Mulund), Ramswroop (Ghatkopar), K. Mantri @ KK (Ghatkopar), jayanti Malad, Royal Malad, R. Mantri (Goregaon), Ghanshyam, Dilip Chandarana @ Matka (Borivali), KK Andheri, Jadio (Western suberbs), Lakshmikant, Vinod Chembur, Harish Thadani @ Haru Hara, Khimji Baaradh Govergattha @ Khimjee Baatli, Nitin Babubhai Majithiya, Suresh Jaswant Advani, Harshad Champaklal Thakkar, Iqbal Mohammad Meman, Gulam Ahamad Noor Mohammad, Ramesh B Mallik, Jayanti Malad, Yasmin, Ramesh Sony (Goregaon), Jateen (Goregaon), Shayam Bhai (Goregaon), Madan Chembur, Mehul Chembur, Ashok Royal, Dilip Transport, Master Malad, DM Mumbai, Ramesh Kapadiya (Kandivali), Jagdeesh Pin (Raheja complex, Malad), Bipin Liladhar (Ashok nagar, Kandiwali), Raju Surat (Thakur Complex, Kandiwali), Jitu @ Chathi Gulli (kandiwali), Ashok Soni (Boriwali), BS Mumbai, Mehul Mumbai, Hitesh Boriwali, Subodh Bhai, Dr.Jayesh Shah, Lakshmikant Gada, Dipak Rajguru, Balaji Nadar, Ashok Kumar Yadav, Uttam Dada, Jayanti Lal Gada, Shanti Lal Gada, Nikki (Ghatkopar), Deepak, Rinku, Girish, Jayanti, Chandu, Bhasker (Kandiwali), Dinesh Mehta @ Bharat and Girish (Arab Gulli), Chotte Miyan (Arab Gulli), Ramesh Kapadiya (Mathura Das Road, Kandiwali-W), Baba Satyam (Bhuleshwar, Kalbadevi), Praveen Kalicharan, Dilip Matka (Western Suburbs), Ranjan Wadi (Malad), Anil Nagda @ Anil Steel (Telang Road, Matunga). Maharashatra – Lakshmikant Thane, LK Thane, Lotus Thane, Jayesh Hero (New Mumbai), Paresh Ghadiyal, Indu Agrawal, Lamboo Agrawal. Madhya Pradesh – Chottu Agrawal, Kailash Indore, Shubhash Indore. Delhi – Shayam Babu Dilli, Ashok Dilli, Raju Kalara, Hari, Pol, Pradeep, Ram Dilli, Arun Dilli, Anand Dilli, Mukesh Dilli, Hans Dilli, Anand Saxena @ Anand Chikna (Sita Ram Bazar), Sanjeev Kohli @ Teepu Kohli, Uttam Chand Jain @ Uttam Topi, Sanjeev Sacher (West Delhi), Rattan Mehta, Naveen Sachdeva @ Tinku Naveen, Sunil Dara @ Ruby Dilli, Gyan Gupta (Punjabi Baug), Pawan Puri (South Delhi), Mukesh Kumar Gupta @ MK Gupta @ Jhon MK @ Jhon (Old Delhi). West Bengal – Raju Kabra, Ameer Chand, Mukesh, Mohan, Kamal Bagdi, Ashok ladi, Shrvan, OP Dhanuka (Kolkata), Bafana Calcutta, Atmaram Bhartiya @ Atmaram Calcutta, BD Calcutta, Shayam Babu Calcutta, Ruiya Calcutta, Jahru Calcutta, Ashok Calcutta. Chennai – Uttam Madras, Shailesh Madras, Nirmal Madras. Rajasthan – Munna Jaipur, JJ Jaipur. Gujarat – Narayan Dairy (Surat), Ashok Surat.